Chef Alessandro Stratta's food is a lot like the French Riviera-beautiful, refined and truly, completely memorable. TravelsinTaste.com recently had the honor of sitting down with Chef Stratta-whose legendary brand of French cuisine couples fresh regional ingredients with a truly global appeal-to discuss his inspirations, his favorite cuisines, his thoughts on culinary culture and, of course, what he does when he's not cooking amazing meals. 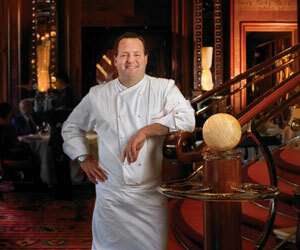 Chef Stratta is currently Executive Chef of Alex, his namesake restaurant at Wynn Las Vegas. His culinary honors, however, pre-date his tenure there by many years, as his exquisite understanding of cuisine is well noted and has earned him numerous awards. Alex, for instance, where he currently hangs his knives, was selected by Esquire magazine in 2005 as one of the "Best New Restaurants in America." In 2006, it received a "Five Diamond Restaurant" distinction from AAA-one of only three such distinctions in Las Vegas. While Alex has proven itself a masterpiece, Chefs Stratta's awards have hung in many kitchens, including Mary Elaine's at the Phoenician Resort in Arizona, where he had his first Executive Chef position. There, Chef Stratta earned Mobil's distinguished five-star rating-given to only 14 restaurants in the country-and was chosen as America's top hotel chef by the James Beard Foundation, which named Mary Elaine's a "top dining destination" and, several years later, gave Chef Stratta its "Best Chef: Southwest" award. After a long tenure at Mary Elaine's, Chef Stratta assumed the reins at Renoir at the Mirage Hotel and Casino in Las Vegas. After just four months in Renoir's kitchen, he once again got the attention of Mobil's five-star award, a distinction that he maintained in each of his six years at Renoir, during which time Renoir was given AAA's five-diamond . All Chef Stratta's awards, of course, are the direct result of a long and successful career. His past experience is rich with high profile mentors such as Alain Ducasse and Daniel Boulud, as well as their 'chef de cuisines' Sotha Khun and Franck Cerrutti. His biggest inspirations, however, are "Franck Cerrutti (of Le Louis XV in Monaco) and Chris Bianco (of Pizzeria Bianco in Phoenix), who he says he admires for their "reverence for exceptional ingredients and their genuine passion and dedication to our trade." Chef Stratta's legendary mentors taught him a wealth of culinary skills that he often uses to please the palettes of influential celebrity clients, including Dr. Maya Angelou, who was named one of America's 30 most powerful women in 2001 by Ladies Home Journal and has been among Chef Stratta's most prominent guests. The real star of Chef Stratta's show, though, is his food. He prepares seasonally-inspired French cooking with Italian undertones, a foundation that's based on regional French techniques and ingredients that complement his unique understanding of and appreciation for culinary history and tradition.